It is definitely more than a diet. It is a lifelong living style for several cultures.It is a modern nutritional recommendation inspired by the traditional dietary patterns of Greece Portugal, Spain, southern Italy and southern France. UNESCO has recognized this diet pattern as an Intangible Cultural Heritage of Greece, Italy Spain and Morocco, thus reinforcing it not only as a fundamental part of their history and background, but also as a great contribution to the world since it is considered to be the healthiest diet in the world. The best anti-aging and long life culture! The Mediterranean Diet is the best way to live many years with a high quality of life. It is also the best way to keep your body in shape, your skin clean and beautiful and your internal organs working properly. It the best diet to lead you to a proportional weight and don’t endanger your health with urgent and unbalanced malnutrition. 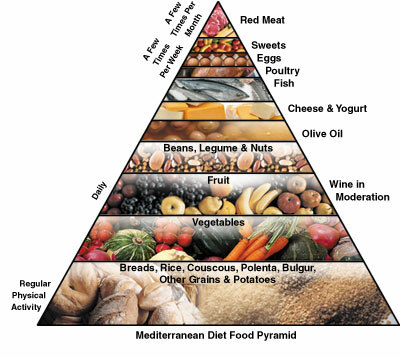 The Mediterranean Diet is also the best way to prevent many diseases. The most important are the “brain ictus” or stroke (first cause of death in women and second in men) and the “myocardial infarction” or heart attack (the main cause in men), but are many more. It has been proved the crucial role of the Mediterranean Diet in the prevention of the metabolic syndrome (some health disorders of which the most noteworthy are too much fat around the waist, high blood pressure and/or insulin levels and unbalanced levels of cholesterol. So it has been in the prevention of lung diseases, asthma, many allergies, Parkinson, Alzheimer, also for keeping the bone mass in elderly people. 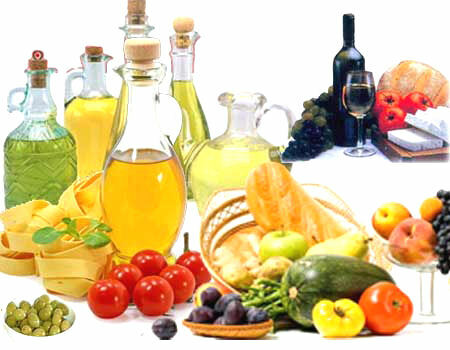 Recently, it has been related the Mediterranean Diet with low incidences of many types of cancer. The principal aspects of this diet include high extra virgin olive oil consumption high consumption of unrefined cereals, high consumption of fruits, high consumption of vegetables, moderate consumption of dairy products (mostly as cheese and yogurt), moderate to high consumption of fish, low consumption of meat and meat products, and moderate wine consumption. The importance of Olive oil. Olive oil is particularly characteristic of the Mediterranean diet. It contains a very high level of monounsaturated fats, most notably oleic acid, which epidemiological studies suggest may be linked to a reduction in coronary heart disease risk. There is also evidence that the antioxidants in olive oil improve cholesterol regulation and LDL cholesterol reduction, and that it has other anti-inflammatory and anti-hypertensive effects.